An online bachelor’s in ministry degree provides leadership training for those who want to work in a church or another Christian organization. In this program, students focus on biblical study, theology, Christian discipleship, and religious leadership and learn how to integrate biblical interpretation into everyday life. This degree provides biblical knowledge to those interested in theological study and dedicating their lives to Christian service. What Will I Learn in an Online Ministry Bachelor’s Program? Southwestern Assemblies of God University ranks #1 on The 9 Best Online Bachelor's in Ministry Programs! Located in Waxahachie, Texas, SAGU offers several online Christian ministry degrees, including bachelor's programs in children and family ministries, genseral ministries, church leadership, and youth and student ministries. Courses cover topics such as Pentecostal doctrine and history and New Testament and Old Testament literature. The general ministries curriculum comprises classes in general education, social and behavioral sciences, natural science and mathematics, and biblical studies. Students also complete 46 credits of career studies, 18 of which must be in a vocational area, and 30 credits of major studies in topics such as biblical preaching, pastoral leadership, and church resource management. Graduates are qualified to obtain ministry credentials with the Assemblies of God and pursue careers as pastors, evangelists, ministry leaders, and missionaries. All full-time SAGU students must take at least one general biblical studies course each semester, and must complete at least 30 credits in 3000- or 4000-level courses. Students in SAGU's fully online programs are eligible for grants. Online students have access to on-campus resources, including the career center, the wellness center, the library, and the counseling center. 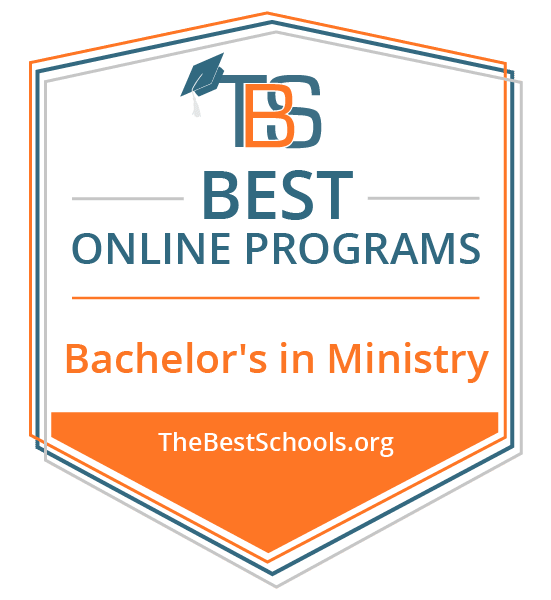 The Master’s University and Seminary ranks #2 on The 9 Best Online Bachelor's in Ministry Programs! The Master’s University in Santa Clarita, California, offers an online ministry program that focuses on the role believers play in God's work. Students take courses in eight-week blocks over three semesters per year. Students taking one class per block complete the program in 28 months, but students can take more classes per block and graduate in as few as 14 months. The program requires 122 semester units, including 42 units of major coursework, 65 units of general education classes, and 15 units of unrestricted electives. Major courses cover topics such as biblical interpretation, contemporary issues in church ministry, and theology of the church. General education courses include philosophy, world history, and critical thinking and quantitative analysis. Electives focus on distinct aspects of biblical living and essentials of Christian education. Applicants must submit a personal testimony detailing their Christian faith and beliefs, a writing sample, a letter of recommendation from a pastor, and high school transcripts. Online students have access to all on-campus facilities, including the career center, library, computer labs, health services facility, and counseling center. The Master’s University offers affordable tuition and helps students understand program costs and financial aid options. The Master’s University is regionally accredited by the WASC Senior College and University Commission. Southwestern College ranks #3 on The 9 Best Online Bachelor's in Ministry Programs! Southwestern College in Winfield, Kansas, offers an online Christian ministry degree that combines theological reflection with contemporary ministry. Students learn current church practices and gain tools necessary to become successful pastors, evangelists, teachers, and faith-based counselors. The program covers biblical and theological studies and emphasizes pastoral studies and youth ministry. Students learn to interpret scripture and how to apply religious traditions to church practices. The curriculum comprises core major requirements, pastoral studies emphasis requirements, youth ministries emphasis requirements, electives, foundation courses, and disciplinary perspective courses. Coursework covers topics such as caring in the Christian community, denominational heritage and structure, teaching methods in youth ministry, and public speaking in ministry. Applicants must have completed at least six college credits with at least a 2.0 GPA. Southwestern students must complete all foundation and major courses with a minimum 2.0 GPA and must complete at least 30 credits from Southwestern. Graduates pursue careers as pastors, teachers, and missionaries. Southwestern provides resources to help online students apply for financial aid. Toccoa Falls College ranks among The 9 Best Online Bachelor's in Ministry Programs! Located in Georgia, TFC offers several online ministry degrees. Students can take youth ministry classes online or pursue an online bachelor's in ministry leadership, which provides skills necessary to become a church minister. Students in the ministry leadership program learn to analyze biblical and theological studies to relate to the members of the church. Coursework teaches students to communicate effectively and organize and manage a congregation. Students majoring in youth ministries learn how to appeal to youths and adolescents in the church. They analyze biblical studies and learn how to communicate those lessons to a younger audience. Both programs require 126 credits in bible and theology, humanities, social sciences, computers, math, and science electives, ministry and leadership, and specialization courses. Ministry leadership students complete coursework in strategies for nonprofit management, leadership formation, and theology. Youth ministries students take classes in emotionally healthy youth ministry, communicating to youth, and youth culture. Online students can participate in services and programs on and off campus, including chapel services and athletics. Remote learners are welcome to serve the Student Government Association. Toccoa Falls College is regionally accredited by the Southern Association of Colleges and Schools Commission on Colleges (SACS). John Wesley University ranks among The 9 Best Online Bachelor's in Ministry Programs! Located in High Point, North Carolina, JWU offers an online Christian ministry degree with available concentrations in Christian counseling, Christian school education, family and youth ministry, pastoral ministry, and intercultural studies and worship arts. Each concentration in the Bible-centered program includes a double major in Bible and theology. The family and youth ministry concentration prepares students to work with parents and children; the curriculum emphasizes the needs, developmental issues, and culture of children and adolescents. Courses cover topics including teaching methods for ministry and retreat and camp ministry, and students complete an internship requirement. Students in the pastoral ministry program receive theological and biblical instruction and are prepared to assume church leadership roles. Courses cover topics such as preaching, pastoral methods, and church leadership and management. Graduates pursue careers as church counselors, private Christian school teachers, church camp directors, pastors, overseas missionaries, and church worship leaders. Applicants must have a high school diploma or its equivalent, must have completed prerequisite high school classes, and must have a minimum 860 SAT score or 18 ACT score and a 2.0 GPA. Online students work with an advisor to explore financial aid opportunities. John Wesley University is nationally accredited by the Association for Biblical Higher Education (ABHE) and is currently seeking regional accreditation from the Southern Association of Colleges and Schools Commission on Colleges (SACS). Lee University ranks among The 9 Best Online Bachelor's in Ministry Programs! Lee University in Cleveland, Tennessee, offers several online ministry degrees, with concentrations including business, church administration, children's ministry, counseling, discipleship, music and worship, pastoral ministry, and youth ministry. The business concentration covers strategies and business practices to help students understand the business side of running a church. Church administration emphasizes leadership roles in the church, and the counseling concentration covers theories and methods for church counseling. Students concentrating in children's ministry learn to articulate strategies to children of the church, and youth ministry expands that focus to include adolescents. The discipleship concentration teaches students the importance of small group ministries, and students pursuing the pastoral ministry concentration develop their ability to preach the word of God to a congregation. Applicants must have a high school diploma or GED and three years of life experience beyond high school. Lee offers affordable tuition and financial aid resources, and online undergraduate students receive discounted tuition rates. Online students have access to all on-campus resources and facilities and are welcome to participate in on-campus events. Grace Christian University ranks among The 9 Best Online Bachelor's in Ministry Programs! Based in Wyoming, Michigan, Grace Christian University, formerly Grace Bible College, offers an online leadership and ministry program that teaches students to approach life from a biblical perspective, develop spirituality in themselves and others, engage with people of all cultures, and build ministry skills. The curriculum combines theoretical and practical knowledge and utilizes class assignments, research projects, and real-world experiences. The 120-credit program covers topics including the life of Christ, teaching and preaching, biblical counseling, and the theology of leadership. Students complete a ministry and leadership capstone. Graduates pursue careers in which they apply leadership, preaching, general ministry, and teaching skills. Grace encourages online students to connect with classmates to help each other learn and improve their ministry and leadership skills. Applicants must submit high school transcripts or proof of GED completion and a ministry reference. Grace does not require an application fee. Online students have access to on-campus resources, including financial aid advising. Grace Christian University is regionally accredited by the Higher Learning Commission (HLC). Piedmont International University ranks among The 9 Best Online Bachelor's in Ministry Programs! PIU in Winston Salem, North Carolina, offers an online ministry degree with 11 available minors, including North American church planting, missions, management for nonprofits, humanities, general ministry, biblical languages, and American sign language. The 130-credit curriculum covers topics including biblical interpretation, church education, Christian ethics, and general psychology. Students complete 44 credit hours of biblical studies requirements, 36 hours of general education courses, and 50 hours of professional and ministry requirements. In addition to classroom requirements, students complete an internship in their area of ministry. Graduates use Bible knowledge to serve their church ministry. Applicants must hold a high school diploma or GED with a minimum 2.0 GPA. PIU helps each graduate find employment in their chosen area of ministry. Online and on-campus students pay the same affordable tuition rate, and PIU provides resources to help students research financial aid opportunities. Online students have access to all on-campus facilities and work with an academic advisor throughout their education. Piedmont International University is nationally accredited by the Association for Biblical Higher Education (ABHE) and is currently seeking regional accreditation from the Southern Association of Colleges and Schools Commission on Colleges (SACS). Manhattan Christian College ranks among The 9 Best Online Bachelor's in Ministry Programs! Located in Kansas, MCC offers online ministry programs that develop students' skills in thirteen areas, including pastoral care, servant leadership, stewardship, and group dynamics. Graduates continue to grow in ministry throughout their careers. The curriculum comprises 150 to 160 credit hours in topics such as the life and teachings of Jesus, poets and prophets of the Old Testament, and Christian beginnings. Graduates work at local churches, ministries, and nonprofit organizations as pastors, evangelists, missionaries, and counselors. The program strengthens each student's relationship with God and helps them improve their ministry skills to better provide Christian public services. Applicants must submit personal references and high school transcripts with a minimum 2.5 GPA. Applicants must have an 18 ACT score or an 840 SAT score. Transfer applicants must submit college transcripts, and those with fewer than 24 college credits or those who younger than 21 must also provide high school transcripts and ACT or SAT scores. Online students have access to all on-campus resources, including academic advising, writing resources, tutoring, and the library. Manhattan Christian College is regionally accredited by the Higher Learning Commission (HLC). An online Christian ministry degree introduces students to the fundamentals of biblical study, theology, and religious leadership. Some programs focus more on community outreach, project management, and other business contexts as applied to faith-based businesses or nonprofit organizations. Other programs specialize in worship arts and biblical studies. A Christian ministry degree helps students engage in spiritual growth and critical thinking through understanding of biblical ethics and the integration of behavioral science. Popular concentrations include Christian counseling, worship leadership, ethics, missions, pastoral ministry, worship arts, counseling, pastoral leadership, Christian education, family ministry, church ministries, biblical studies and theology, and preaching. Most online ministry degrees require 120-128 credits, consisting of general education courses, Bible and theology coursework, and electives. Core classes include ministry leadership, congregational dynamics, Old and New Testament studies, history of the church, systematic theology, church life, spiritual formation, and world missions. Many online ministry programs culminate with a capstone course, ministry internship, or practicum, in which students gain hands-on experience in churches and other religious settings. Graduates go on to pursue careers in various roles, such as clergy, youth leadership, religious education, and music. What Will I Learn in an Online Ministry Bachelor's Program? General education courses for ministry programs and youth ministry classes online include Bible studies and electives. Offered curriculum varies between each school and the student's core concentration. Sample coursework for an online ministry degree may contain any of the studies shown in the list below. Survey of Old and New Testament: Students in survey classes examine the historical background, translations, and key themes of the Old and New Testaments. Coursework covers the development of the Gospels and the nature of the intertestamental period. Online students learn to prepare sermons from both texts and practice sermon delivery through preaching experience. Christian and Pastoral Ethics: Christian and pastoral ethics courses examine the contemporary and historic development of Christian values. These courses help students learn how to think critically and make wise and faith-driven choices as a representative of Jesus Christ. By examining case studies and traditional ethical codes in religious settings, students gain a solid understanding of the foundations of Christian ethics and the relationship between values and contemporary issues. Leadership: Leadership classes help students develop strong leadership qualities and administrative competencies. These courses emphasize the importance communication, interpersonal abilities, and teamwork. Students examine training, organization, supervision, program evaluation, and financial management within the church, Christian workplace, and other religious-based settings. Biblical Studies and Interpretations: Biblical studies and interpretation courses examine the historic, cultural, and literary contexts of the Bible. Focusing on the methods and principles of biblical interpretation, students examine the structure, content, key themes, and messages of the books of the Bible. Online learners examine the important relationship between the church's scriptures. Religions and Cultures: These courses examine the world's major religions including Christianity, Judaism, Islam, Hinduism, and Buddhism. Online students examine various cultures and how they influence the mission and growth of the Christian church. Students reflect on their own cultural worship and the effect of religious participation and spirituality on society. Online ministry programs prepare graduates for clergy positions, such as priests, ministers, and pastors. Graduates also go on to pursue careers as church directors, youth leaders, missionaries, and religion and Bible study teachers in churches, faith-based schools, or nonprofit organizations. Clergy: Clergy describes individuals who pray, promote spirituality, read from sacred texts, and conduct religious worship services. Clergy includes priests, ministers, and pastors. They organize and lead community outreach initiatives, deliver sermons and other talks, provide spiritual and moral guidance, and teach Sunday schools and Bible studies. Director of Religious Activities and Education: Directors of religious activities plan and oversee group programs at churches, religious schools, and other faith-based organizations. They recruit volunteers, train staff, select curriculum and develop education programs, market and publicise programming, and perform other administrative duties. Directors also provide marital, interpersonal, financial, and health counseling to members of their congregations. High School/Postsecondary Religion Teacher: High school and postsecondary religion teachers work at faith-based high schools, colleges, universities, teaching academic lessons and courses in philosophy, religion, and theology. They also conduct research, prepare lesson plans, advise students, grade assignments, and perform other administrative duties.